First went Darrell Bevell. Then Tom Cable. And there could be more to come. But the first two sent Seahawks fans into a frenzy. Here's what they're saying. Just call the Seahawks your everyday millennial. On Wednesday, they officially cut the cord. Tom Cable is out, and so is Darrell Bevell, with possibly more moves on the horizon. Cable, as offensive-line and assistant head coach, and Bevell, as offensive coordinator, had been on coach Pete Carroll’s staff since 2011. They won a Super Bowl and lost another; witnessed and helped nurture the rise of the most dominant era of professional sports in Seattle history. 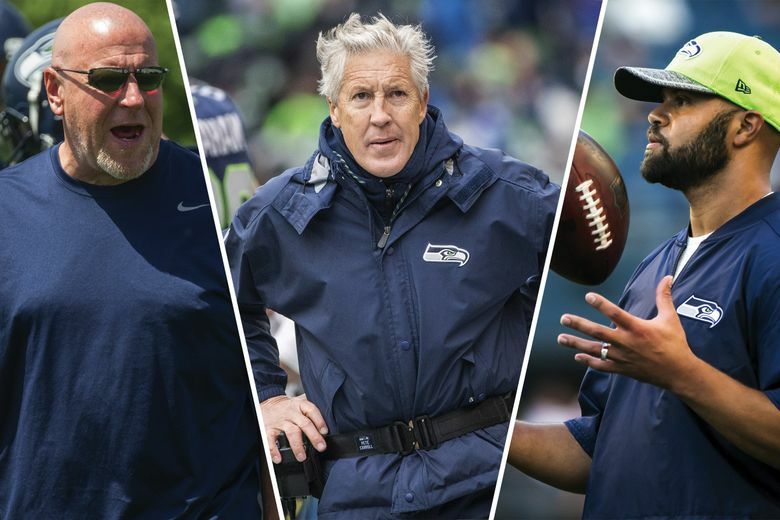 Will be interesting to see if #Seahawks reshape roster as aggressively as they're re-shaping coaching staff. I feel like some of the coverage of Bevell's firing has been slanted at the one-yard line oh my gosh why do I hate myself. So wait….Schneider signed Walsh to ensure we missed the playoffs, resulting in coaching changes? Right? Today is the day the Seahawks officially got over Super Bowl 49. Far as I can tell, Bevell's only real fireable "sin" was a fundamental misunderstanding of the kind of player Jimmy Graham is. Got Graham sort of foisted on him in the trade and seemed to want a more traditional blocking tight end. Still think the wrong guy got fired. Tom Cable had to go. Imagine trying to hire a new offensive coordinator but telling him he had to have Tom Cable as his offensive line coach and de facto run game coordinator. No disrespect to the Seattle offensive coaches but their offense needed a fresh start. Take on Bevell: Had to coach offense to fit Carroll's philosophy, and offense finished 7th or better in DVOA from '12 to '15. Had nothing to do with run game. Developed young QB under tough circumstances. Will never escape shadow of Super Bowl INT. Overall, under-appreciated. Starting the timer…now on when fans will come on here complaining about the new OC, DC, and OL coach and possibly even bemoan the loss of one or all of these guys. That’s a commentary on fickle fans, not on the decision Pete has made to move on. Very much support that move now, and will support it regardless of how the news guys pan out. It’s the right time and the right move. If Richard is actually out, and it sounds like he is, if I'm the Seahawks I'd absolutely at least give Jimmy Lake an interview. I think he's a coaching star. I'm very biased, though. And, at the end of the day, the only word out of the Seahawks? Not so much a word but an emoji from center Justin Britt.